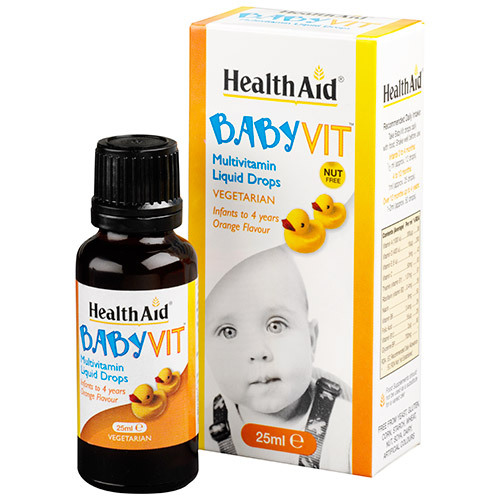 HealthAid BabyVit - Multivitamin Liquid Drops are specially formulated to provide a wide range of vitamins to help safeguard the infant diet. It may help maintain a strong and healthy diet for a growing infant by providing good nutrition and a well-balanced diet. Babies and infants who do not obtain sufficient nutrients from their diet due to poor eating habits. Babies and infants lacking in energy due to poor sleeping patterns and anxiety. Babies and infants who have difficulty with swallowing tablets. Babies and infants on medication or those recovering from illness. Babies and infants who need help with mental stimulation, focus and concentration. Thickener (glycerine BP), Sweetener (sucrose), Vitamin C (ascorbic acid), Stabiliser [poly ethylene glycol 40 (PEG40)], Niacin (nicotinamide), Vitamin E (dl-alpha tocopherol acetate), Flavour Enhancer (orange oil), Thiamin HCl (vitamin B1), Riboflavin (vitamin B2), Vitamin B6 (pyridoxine HCl), Vitamin A (acetate preparation), Folic Acid, Vitamin D3 (cholecalciferol preparation), Preservative (sodium benzoate), Vitamin B12 (cyanocobalamin preparation). Free from: yeast, gluten, corn, starch, wheat, nut, soya, dairy, artificial colours. Take BabyVit drops daily with food. Shake well before use. Infants 0-4 months: 1/2ml (approx. 12 drops). Infants 4-12 months: 1ml (approx. 25 drops). Infants 12 months - 4 years: 1-2ml (approx. 50 drops). Below are reviews of HealthAid BabyVit - Multivitamin Drops - 25ml Drops by bodykind customers. If you have tried this product we'd love to hear what you think so please leave a review. HealthAid BabyVit - Multivitamin Liquid Drops are specially formulated to provide vitamins to help safeguard the infant diet. It may help maintain a strong and healthy diet for a growing infant by providing good nutrition and a well-balanced diet.